Many women experience weight gain as they age. This can be frustrating because weight gain can appear even when their diet and exercise patterns remain consistent. Menopause and the aging process can cause weight gain and excess weight may become concentrated in more noticeable places. Although the body does naturally change with age, weight gain and the health consequences that come along with being overweight or obese should not be seen as an inevitable part of aging. Why Is Menopause Causing My Body to Change? Women who have experienced surgical menopause tend to put on more weight at a faster rate than those who have not. As people age, they naturally begin to lose muscle mass and gain body fat. Because muscle uses up more energy and calories than fat stores, as people get older, their bodies tend to need fewer calories. However, most people do not cut back on their calorie intake, and this can cause surprise weight gain. How Does Menopause Cause Weight Gain? During menopause, a woman's estrogen levels fluctuate and drop, and one of estrogen's jobs is to distribute fat around the body in order to protect the reproductive organs. This means that during menopause, the body tends to redistribute weight to the abdominal area instead of to the hips, thighs, and buttocks. This redistribution can exacerbate weight gain. On average, a woman gains 10 lbs. 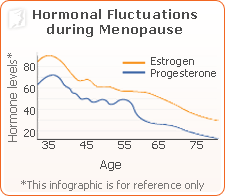 (4.5 kg) during menopause. This weight gain can be frustrating for women, because weight gain not only can alter self-perception, confidence, and how they are seen, but it can also lead to serious health conditions. People who are overweight or obese are at a higher risk for some cancers, heart disease, diabetes, body pains, and high blood pressure. What Can I Do About Menopausal Weight Gain? The mantra "eat healthy and exercise regularly" is repeated so frequently because it works. A balanced diet and regular exercise can help a woman lose weight and become healthier overall. If you are looking for guidance on how to kick-start your exercise regimen or how to eat healthy, it is a good idea to consult a doctor who can refer you to a dietitian or other specialists. However, it is important to keep in mind that a person should get at least five servings of fruits and vegetables each day and consume enough whole grains, lean proteins, and water. Cutting back on processed food, junk food, white bread, and soda will also benefit your health. Click on the following link for more information about treatments for weight gain as a result of menopause.